Well, I ain't got no bread and I ain't got no wine but I do have something Holy Thursday related! On Holy Thursday we Greek Orthodox type peeps dye our Easter eggs. We dye them red to symbolize the blood of Christ and in commemoration of the Last Supper. 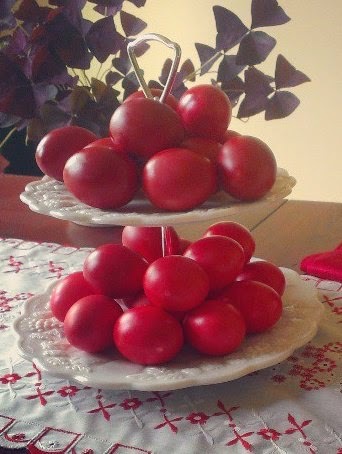 Maybe this year I'll make tsoureki and add a couple of the eggs. Mmmmm. a) I'm a goober and forgot to link back to Cari. So, hey! Go check out Cari's awesome post that actually includes bread and wine AND a baby chick! b) My explanation up there sounds incredibly textbookish. Snoozefest!